ePublishing Knowledge BaseePublishing Knowledge BaseePublishing Knowledge Base User Profiles and Registration FormsHow do readers access the new Purchased Content page? The new Purchased Content page is a tab found within the reader's profile area on your website. From this page, the reader can quickly access purchased single articles, entire paid newsletter issues or publication editions, and the variety of premium downloadable files, audio files, or videos. The page is located at https://www.yourdomain.com/user/profile and the reader will need to be logged in to access past purchased content or downloads. 1. Click Profile or go to https://www.mydomain.com/user/profile to access the reader's account. It is generally found at the top of your site's pages. 2. Within the /user/profile section of the website, navigate to the Purchased Content tab. Zoom: Within the /user/profile section of the website, navigate to the Purchased Content tab. 3. 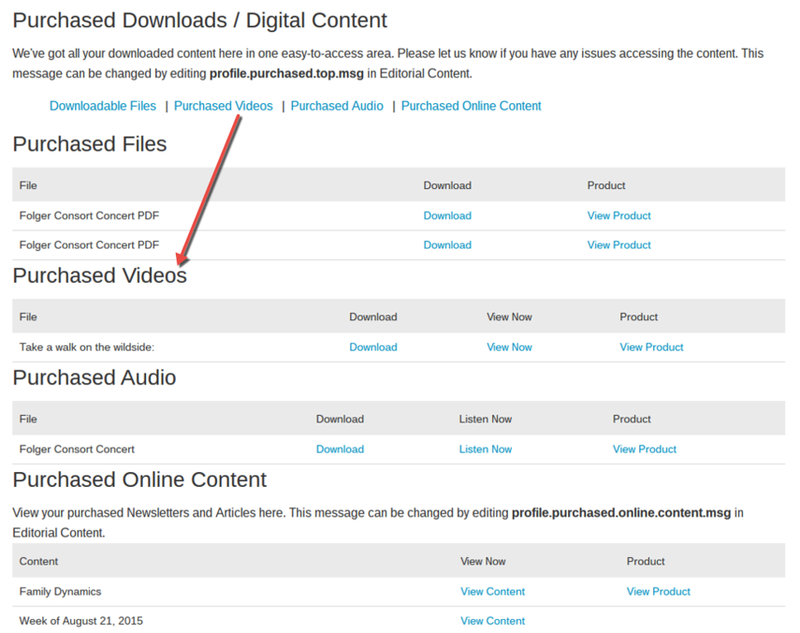 Access Downloadable Files and Purchased Videos, Audio, and Online Content under the Purchased Content tab. 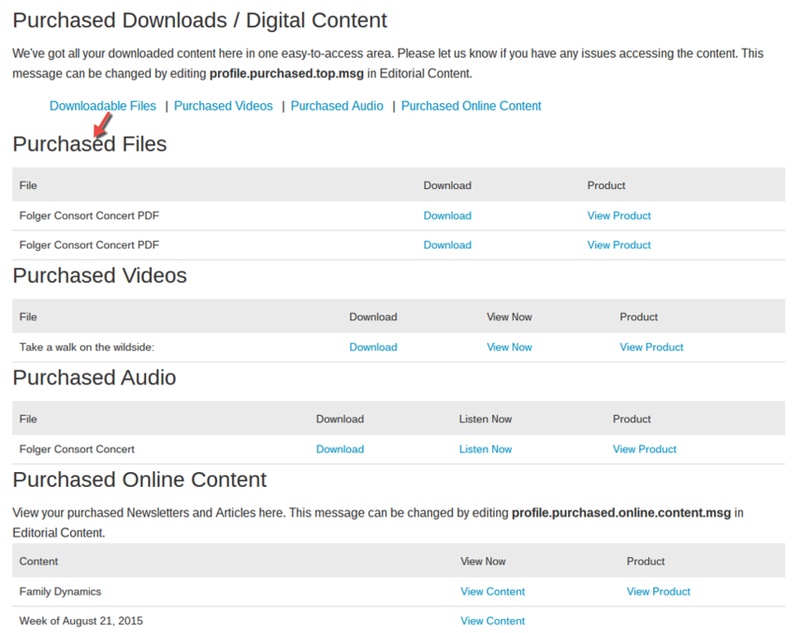 Zoom: Access Downloadable Files and Purchased Videos, Audio, and Online Content under the Purchased Content tab. 4. Click the anchor links (as indicated above) to jump easily between the sections. 4.1. 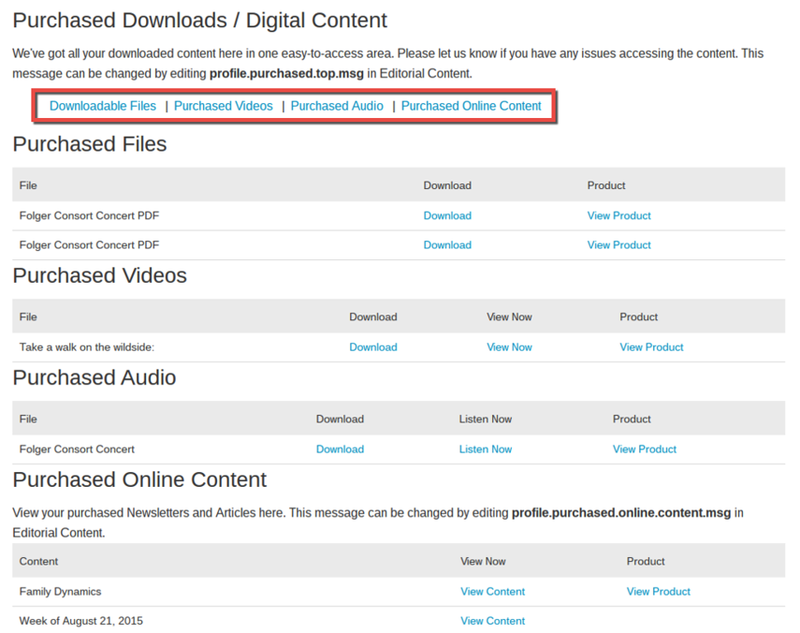 Downloadable Files: In the Purchased Files section, downloadable files will be listed. The reader can download files directly by clicking the Download link on right or go to the product’s description page by clicking the View Product link. The introductory paragraph for this section can be changed by editing profile.purchased.top.msg in Editorial Content in your website's Admin. Learn how to update Editorial Content Zones in this article: How do I edit an existing Editorial Content block? Zoom: Downloadable Files: In the Purchased Files section, downloadable files will be listed. 4.2. Purchased Videos: In this section, view purchased videos. Click Download on the right side of the line item to download the purchased video. Click View Now on the right side of the line item to view the purchased video. Click View Product to view the product’s description page. Zoom: Purchased Videos: In this section, view purchased videos. 4.3. 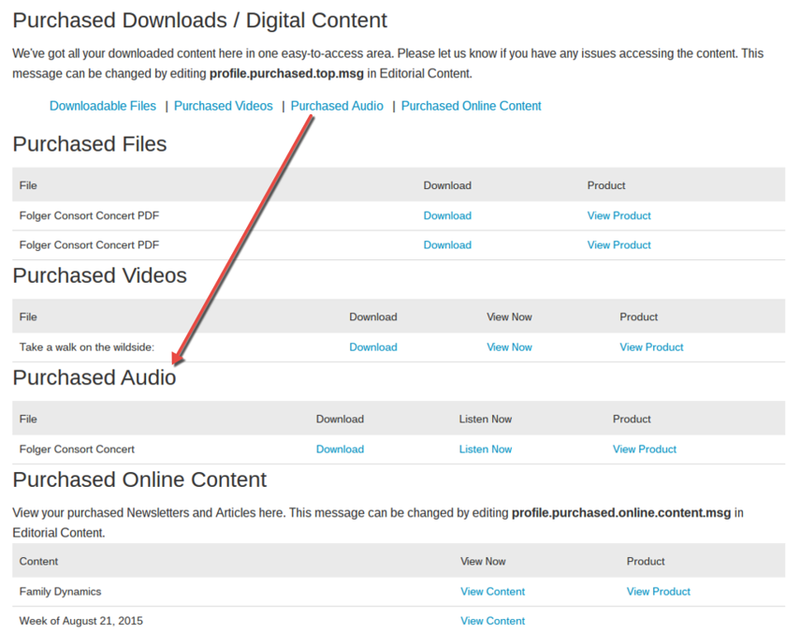 Purchased Audio: In this section, view purchased audio. 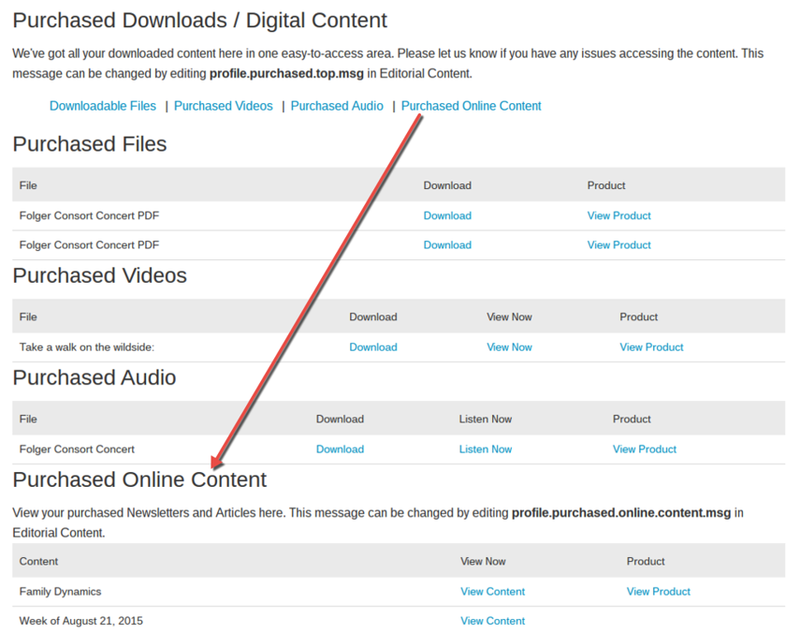 Click Download on the right side of the line item to download the purchased audio. Click Listen Now on the right side of the line item to listen to the purchased autio. Click View Product to view the product’s description page. Zoom: Purchased Audio: In this section, view purchased audio. 4.4. Purchased Online Content: In this section, view purchased newsletters and articles. Click View Content on the right side of the line item to view the purchased content. Click View Product to view the product’s description page. The introductory paragraph for this section can be changed by editing profile.purchased.online.content.msg under Editorial Content in your website's Admin. Learn how to update Editorial Content Zones in this article: How do I edit an existing Editorial Content block? Zoom: Purchased Online Content: In this section, view purchased newsletters and articles. Prev: How can a reader print an invoice for a past order? Next: What are the differences between the old Order History tab and the new Past Orders tab on readers' account profiles?